Tied by Monte Smith for our first ever fly swap. Slip a size 8/0 (I use Gick glass beads) glass bead on your hook and move it to the eye. Attach your black thread (8/0 or smaller) and wrap to mid-shank. Attach a shank length clump of black marabou for the tail and surround either side of it with a strand of light blue Krystal Flash. Wrap to the rear of hook and clip the Krystal Flash so that it does not extend beyond the tail fibers. Next, attach two strands of the Krystal Flash to use for a rib. Attach 3 or 4 black ostrich herls (you can substitute marabou if you'd like) at the rear of the body, then wrap your thread forward to the eye. Carefully wrap the ostrich forward to a point just behind your bead and tie off. You may want to trim the body at this point to tidy it up, but it's not a necessity. Now wrap your strands of Krystal Flash forward through the body to create the rib and tie it off, but do not clip the excess yet. Use your thread to position the 2 strands of ribbing material on top of the hook shank right up to the bead. 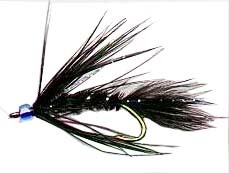 Pull the KF back over the body and tie off with a few turns of thread (working your way back toward the tail). This secures the 2 "horns" of Krystal Flash and creates a base to attach your hackle. Clip the 2 horns to length so they don't extend beyond the tail. Prepare a black soft hackle feather - I really like pheasant rump feathers - and tie in by the tip. Fold the hackle slightly with your fingers so that it will lay back over the body as you wrap it 2 - 3 turns to create the collar. Tie off and clip the excess. Finish with a few more turns of thread while holding the hackle back over the body. Whip finish and you're ready to fish the Midnight Blue. This has been an outstanding prospecting fly for me when fishing for trout in stillwaters throughout the Northwest U.S. It has also been successful with smallmouths and, in smaller sizes, panfish. Enjoy!